Dog behaviour researchers at the University of Lille in France recently found that dogs that have “run out” of self-control make more impulsive decisions that put them in danger. And yet traditional dog obedience training is all about teaching self control. Have we been getting dog training all wrong..? Miller and her colleagues found that dogs give up more quickly on a task after they’ve had to hold a sit-stay position than if they didn’t have to exhibit any self control in the first place. So how does this apply in the real world..? It means that putting a dog in a sit or down stay and expecting them to be controlled has it’s limitations. Eventually the dog loses patience and what happens next is more likely to be irrational and uncontrolled. That’s never going to be good, is it? 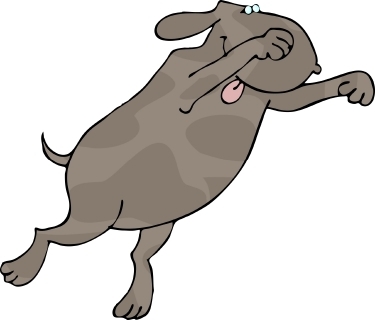 In the real world we see this happening very frequently: A dog is being walked that is prone to lunging on lead at other dogs – aggressively or not – the traditional obedience training answer has been to put the dog in a sit stay and ask the other people to come past. You could be creating a ‘champagne cork’ situation here. It’s fine if your dog manages to hold it together, but not so good if he runs out of patience half way through and ‘pops’. What happens next will invariably be worse than if you’d not made him stay in the first place. Interestingly, trainers of protection dogs have known this for a years. If you’re training a police dog to explode into aggressive action against the nasty man in the padded suit, first you hold the dog back (Or teach him to hold himself back in a ‘stay’). He’ll then wind himself up before you let him go. That’s OK for police dogs, but it’s not the kind of thing you want to be training for your pet dog by mistake is it? The answer is to train dog walking in a way that ensures your dog knows he must walk calmly with you and past the object of his desires if you choose to do that. ‘Keep calm and carry on’ as they say! It’s not easy with a reactive dog, but it’s a much better bet than trusting to luck with a sit-stay. Don’t misunderstand me – I’m NOT saying stay isn’t a useful exercise to train. It certainly is and here at Dogfather Training we have a unique technique to train a calm patient stay in the most impatient of dogs and puppies. (You have to see it to believe it!). The issue here is that ‘stay’ isn’t the answer to everything – or for every dog – and there are times when it’s absolutely the WRONG thing to do. The trick, of course, is in knowing the difference. But I can help you with that!